Having had a pretty good adventure Monday, I kept it short today. Particularly since this was a day for chores. The bathroom remodel is back on track, after having mold remediated and so certified. But we’re still on one bathroom until it’s complete, and this week, the drain plugged. In a houshold that includes three young adults, This is Not A Good Thing. I tried snaking it out, but the snake hit a hard surface and refused to turn past it. I looked under the tub (it’s a hot tub with accessible plumbing) and, yeah, the drain pipe has some pretty sharp kinks. I pulled a few strands of greasy Kira-hair out (Kira is the only one in the family with really long hair) and dosed the drain with concentrated lye; it helped but only a little. I tried the snake again; this time something gave, I snaked waaay down the pipe without hitting any further obstructions, and when I pulled the snake out, a plastic cap from a shampoo bottle or deodorant stick came out with it. Next came getting the oil changed in the Wandermobile, which meant going down to my favorite Jiffy-Lube in Pojoaque. These folks have always been pretty good so that’s where I prefer to take the cars. This time they lubed it up right fast, didn’t try to sell me any additional service except a rat repeller gadget for my engine compartment (which I took; I’ve had ongoing problems with rodents in my engines) and let me have the coupon price even though I’d neglected to bring in my coupons. Like I said, they’ve always been pretty good to me. Then on to Santa Fe, where I had some shopping to do. But not before taking a little excursion up Hyde Park Road, for which I had a road log. My first target was an outcrop of Bishop Lodge Member that was supposed to be here. I thought maybe I was seeing it in the shallow road cut, but it turns out not to be well exposed here, and I didn’t get a photograph. No matter; I’ll get one later. 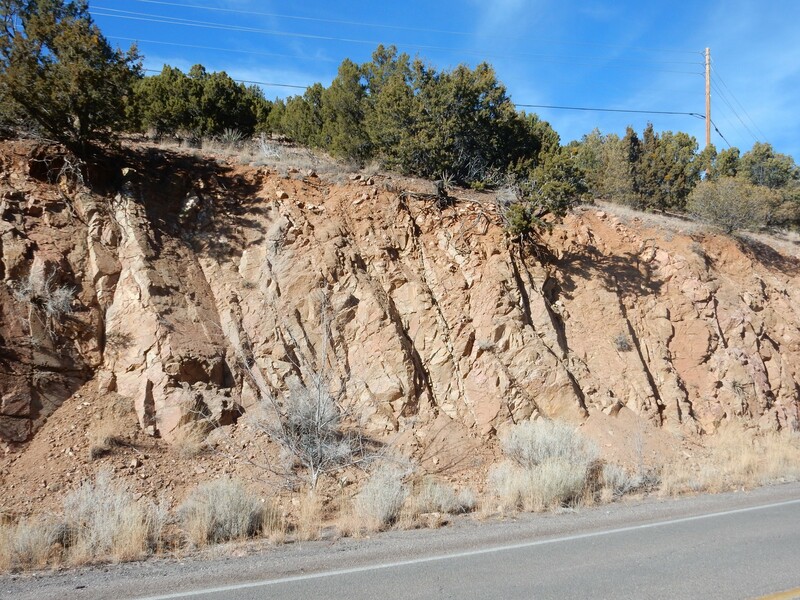 First stop then is the contact of terrace gravels with the Precambrian rocks of the Sangre de Cristo. My camera failed to tag the photograph, but about here. 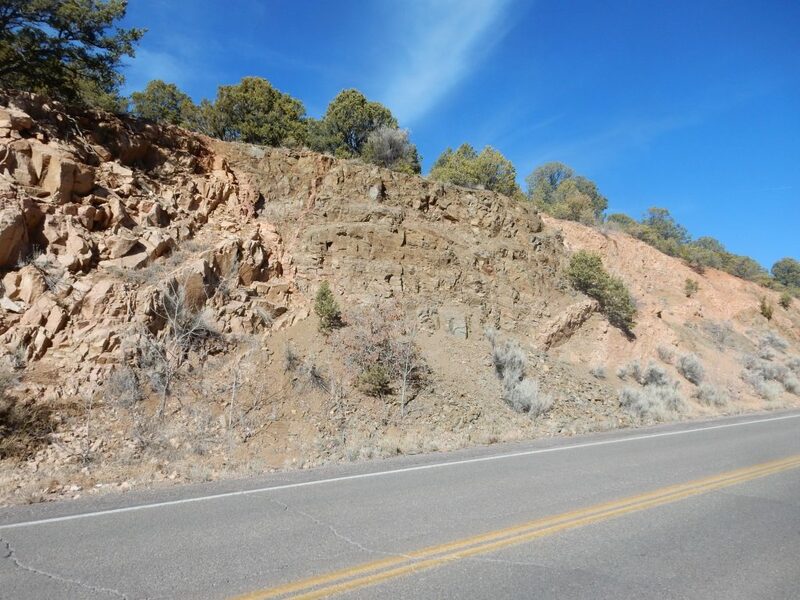 This is the geological boundary between the Rio Grande Rift and the Sangre de Cristo Mountains. The Rio Grande Rift is a great crack in the Earth’s crust that runs from central Colorado to around El Paso, roughly along the valley of the Rio Grande. It first began to open around 30 million years ago. 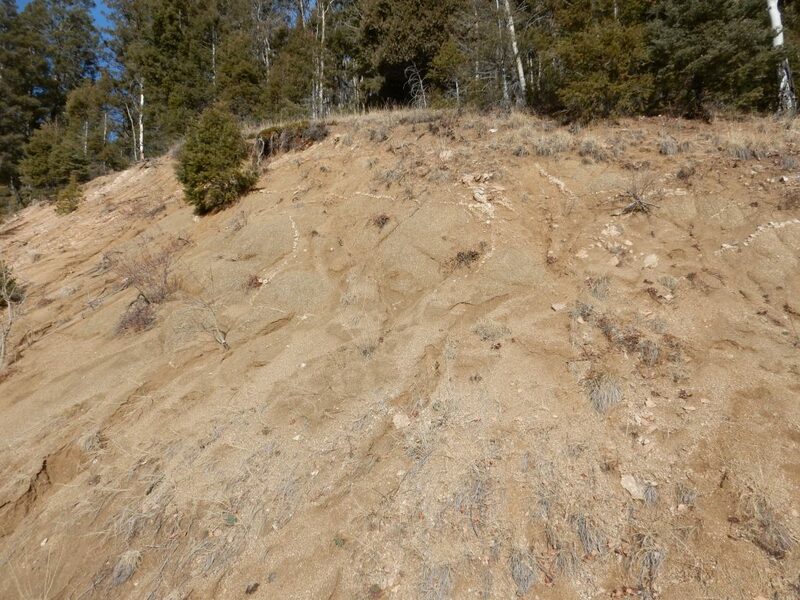 The Sangre de Cristo are likely older, dating back to the Laramide Orogeny, which peaked around 50 million years ago. Both are related to western North America approaching and then overriding the East Pacific Rise, a great upwelling of hot mantle rock that is part of the worldwide Mid-Ocean Ridge system. As North America approached the Rise, the oceanic plate subducting under North America began to subduct at a shallow angle (because it was young and relatively buoyant) which compressed the overlying crust to form mountains. This was the Laramide Orogeny. When North America reached the Rise, the western part of the continent began to be uplifted and pulled apart; this created the Basin and Range and tore the Colorada Plateau away from the center of the continent. The Rio Grande Rift is the crack where the Colorado Plateau was pulled loose. Most likely the Rift is continuing to open and the Sangre de Cristo is still rising. 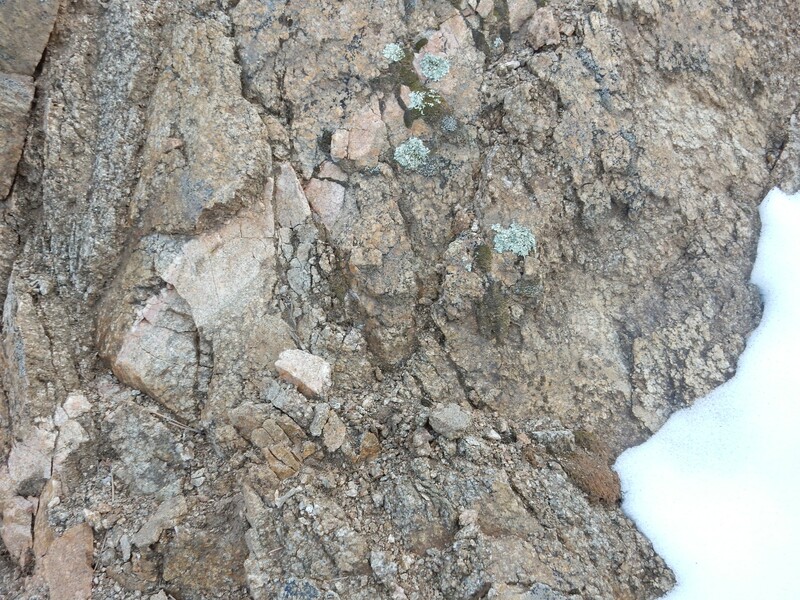 A little further down is a good exposure of granite gneiss. This is a metamorphic rock consisting of quartz and potassium feldspar with smaller quantities of plagioclase feldspar and biotite. 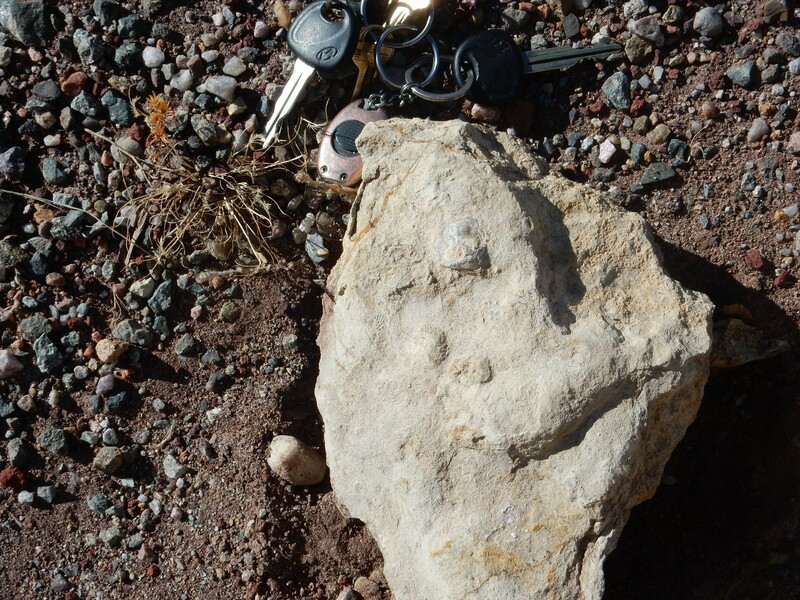 There are dikes, patches, and pods of amphibolite scattered in the gneiss, like this one. 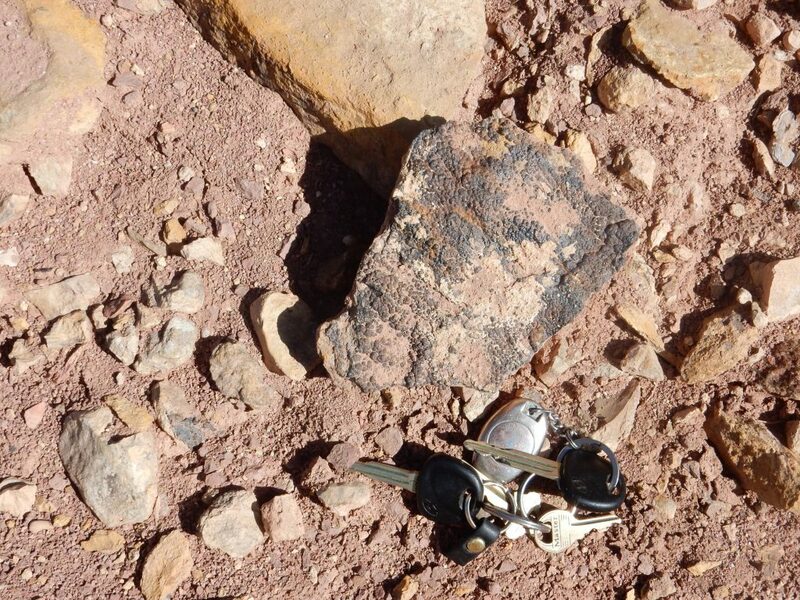 The black, rounded rock is the amphibolite, so called because it is rich in amphibole minerals. It was possibly once basalt before being subject to metamorphosis. 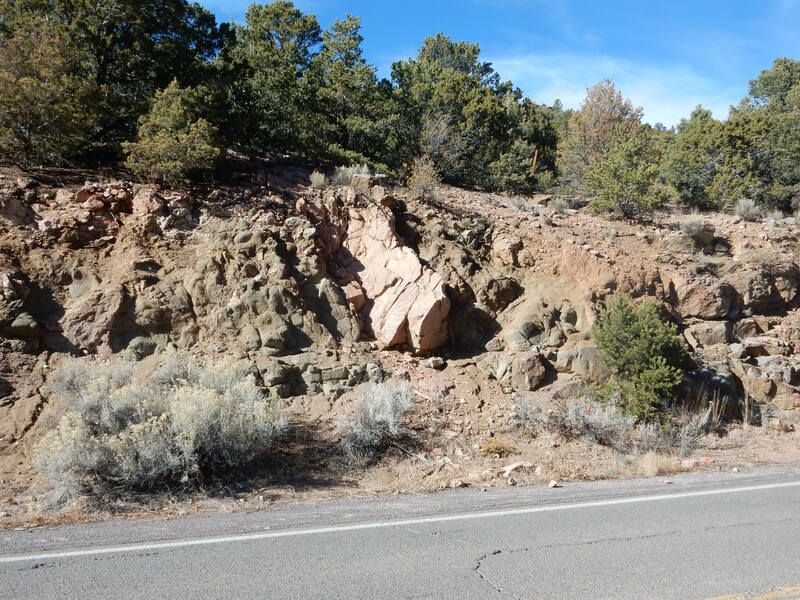 The pink ridge is a pegmatite dike, composed almost entirely of coarse-grained quartz, potassium feldspar, and traces of mica. 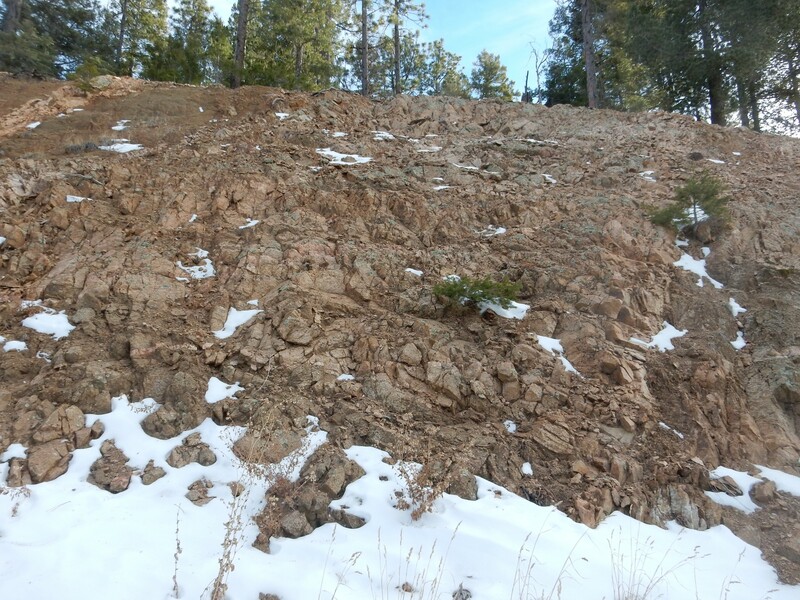 This shows what looks like a big dike of amphibolite intruding the granite gneiss, and in turn intruded by smaller pegmatite dikes. Which would pretty much be my guess for the geologic history. Based on resemblance to other rocks in the region that have been rediometrically dated, I’d guess around 1.4 billion years for all the rocks here. Further down, we hit Proterozoic beds. Notice the thin limestone beds on top sitting on loose reddish sediments. The sediments must be older than the limestone. All are mapped as Madera Formation, dating back to the Pennsylvanian Period some 310 million years ago or so. Northern New Mexico was then a shallow sea dotted with islands, a perfect environment for depositing limestone. This chunk had some interesting concretions. They look crystalline, but I couldn’t say what mineral for sure. Perhaps calcite with considerable iron contamination, or even straight-up siderite (iron carbonate.) However, the siderite crystals I’ve seen don’t have quite this shape and are more a chocolate brown. The beds also contain scattered fossils. I took a chunk containing both fossils and crystals for later scrutiny. This photograph is not actually from today’s trip; the light was bad today and I’d visited this spot before. 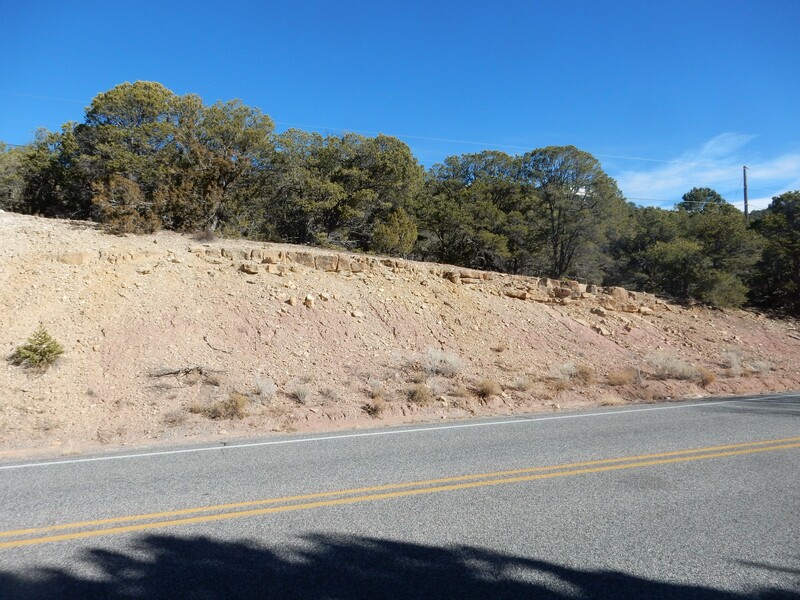 The upper beds are Paleozoic, the geologic map showing them as Madera Formation but one of my road logs identifying them as dolomite of the Mississippian Arroyo Penasco Formation. This sits on shattered Precambrian granite. 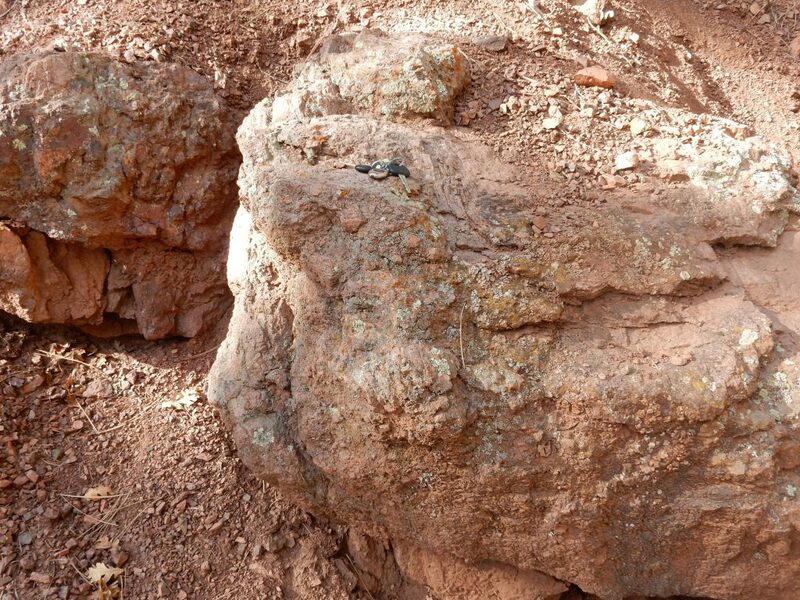 The contact here is a gap in the geologic record of at least 1.4 billion years, corresponding with a similar wide gap in the geologic record across western North America that John Wesley Powell dubbed the Great Unconformity. 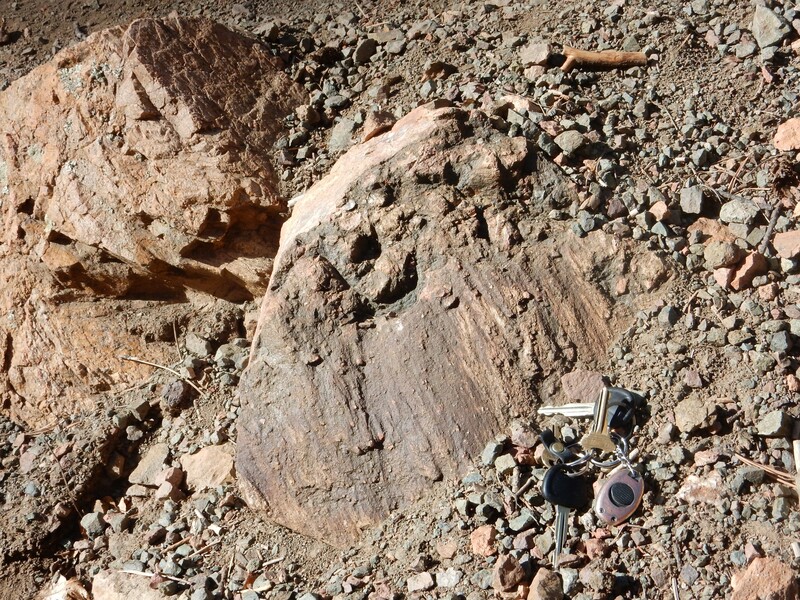 The shattered granite may be an impact breccia. 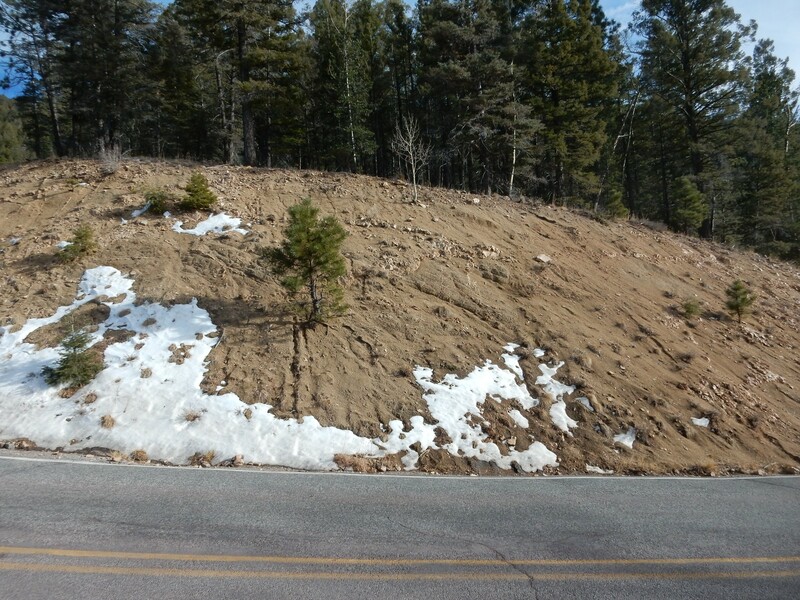 Further east along the road, there is a road cut where shatter cones are exposed. 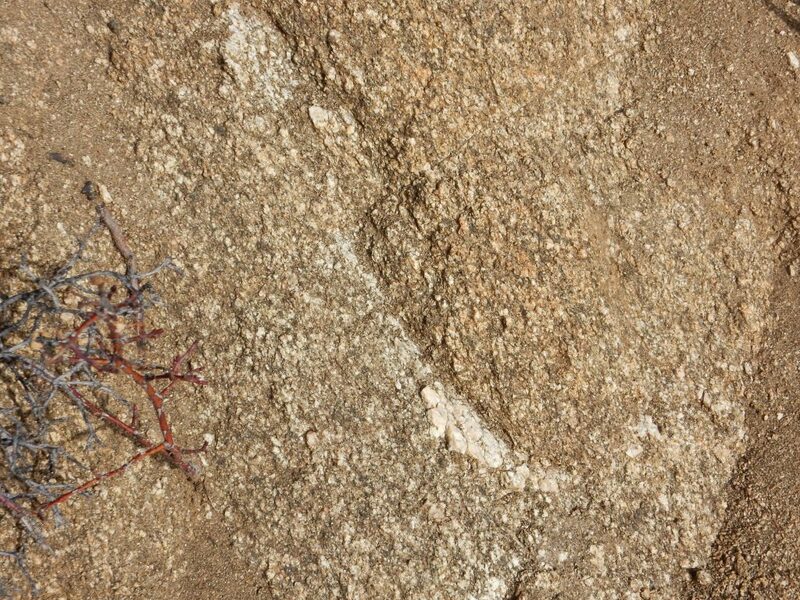 These are really tough to spot; I found them once, with Bruce Rabe, but my photograph didn’t show them well and I’ve never been able to find them since. They are the result of a large meteor impact, sometime during the time interval of the Great Unconformity. The impact has been confirmed by the detection of shocked quartz in the rocks, but the actual crater has long been deformed by faulting and eroded into invisibility by wind and rain. 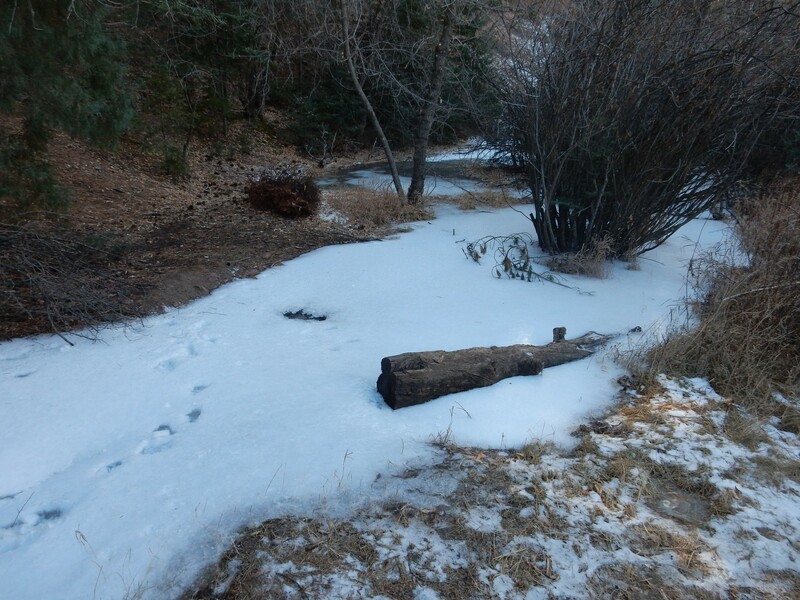 After failing (again) to spot the shatter cones along the road, I stop at Chamisa Canyon for a break. Winter seems to be missing from White Rock, but there are signs of it south of the road here. 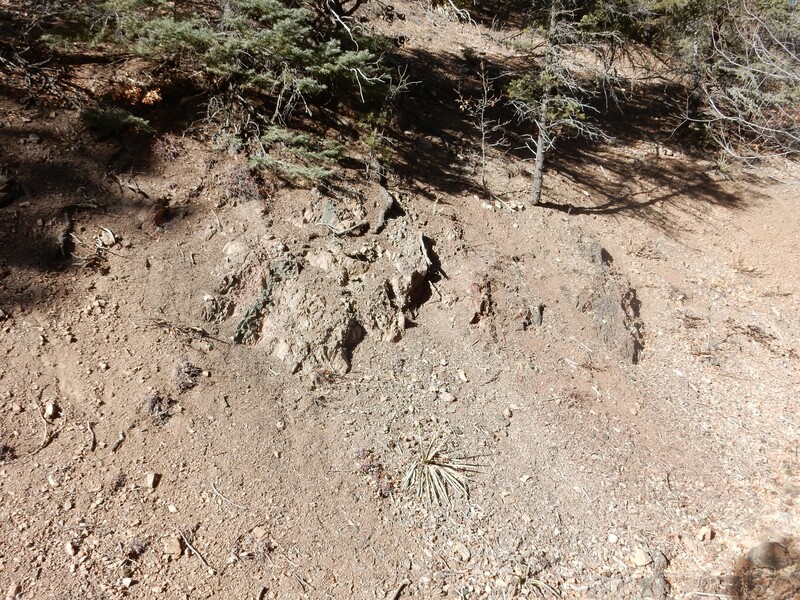 North of the road is Chamisa Trail, which follows a fault trace. 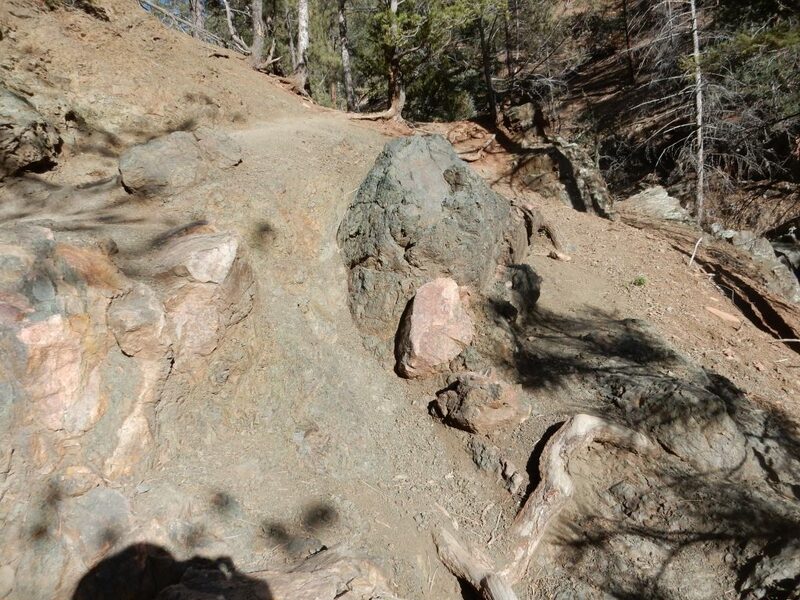 My log book mentions fault breccia up the trail. Well, why not? 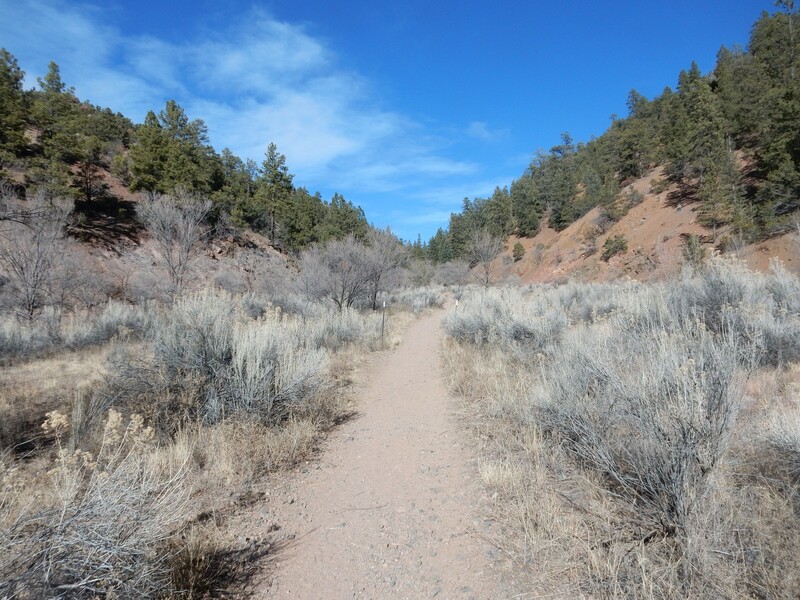 It’s a well-maintained, busy trail, and I need the exercise. I head out. Hmm. I’ve found that the forest people have different notions of what is difficult than I do. 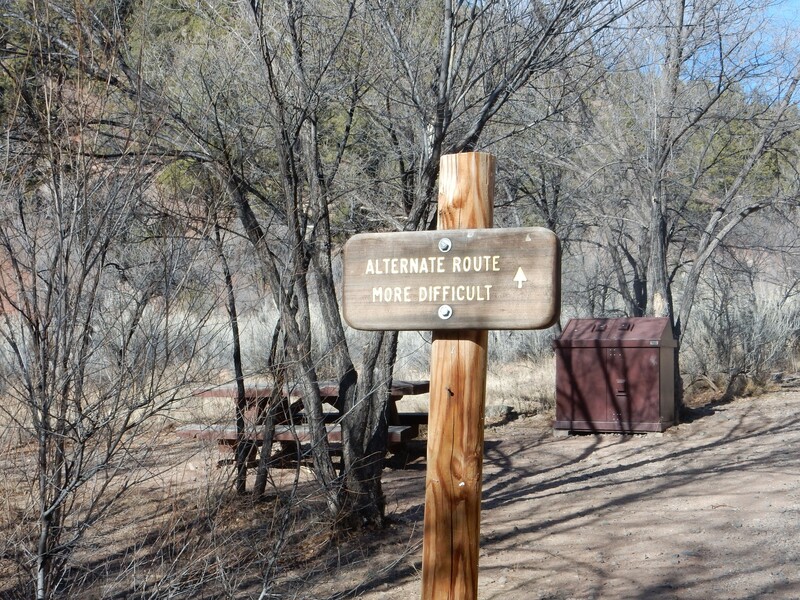 I hate going downhill, but their signage seems to assume that going uphill is harder. Nevertheless, the first part at least is perfectly level. I don’t plan to go far. Notice how much darker the left side of the canyon looks than the right. Oddly, the right side is mapped as dark amphibolite and the left as lighter granite gneiss. It’s the weathering; the amphibolite weathers to rusty red. Not sure what all this is about, but it looks cool. I’m looking and the red and black banding to the left. As I’m hikingn, I’m keeping an eye out for fault breccia. To be honest, I’m not sure what it will look like. This, perhaps? 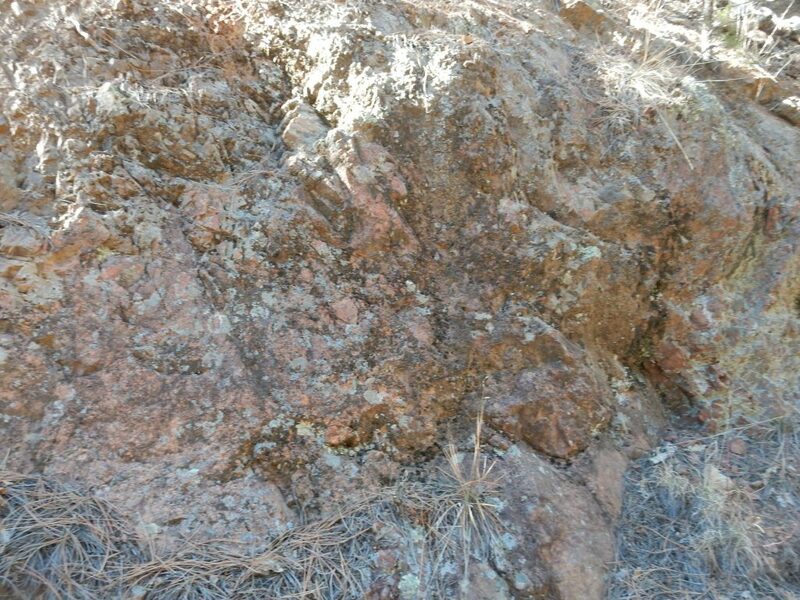 This looks like it might be crushed granite gneiss that subsequently was cemented back together; it doesn’t look like the intact gneiss, which is blocky in outcropping. 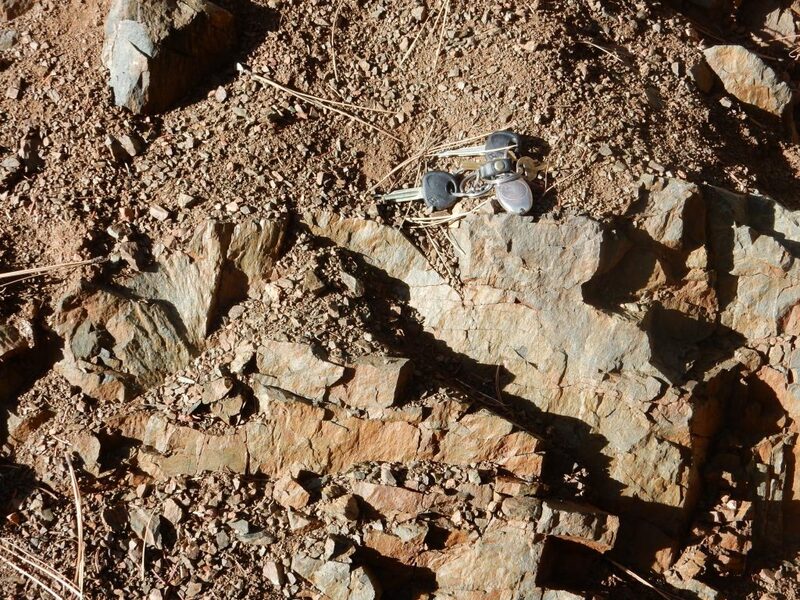 So maybe it’s fault breccia, the broken rock that forms right along a fault trace. 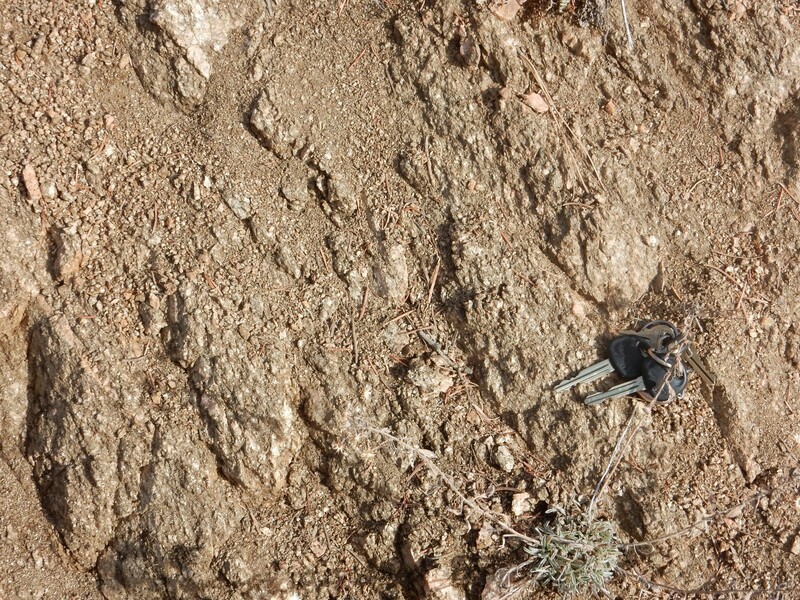 This might possibly be slickensides, a surface ground by fault motion. And the top of the rock looks like it might be cemented breccia. See, this is the problem with trying to learn geology on your own, from reading about it; the textbooks always show the finest examples of a particular phenomenon, which doesn’t actually teach you to spot less splendid examples in the field. Which is not to say I’m not having a blast trying. Particularly since there is similar black rock just to the east that is quite blocky in appearance. And there are chunks of pink granite gneiss from the other side embedded in this. 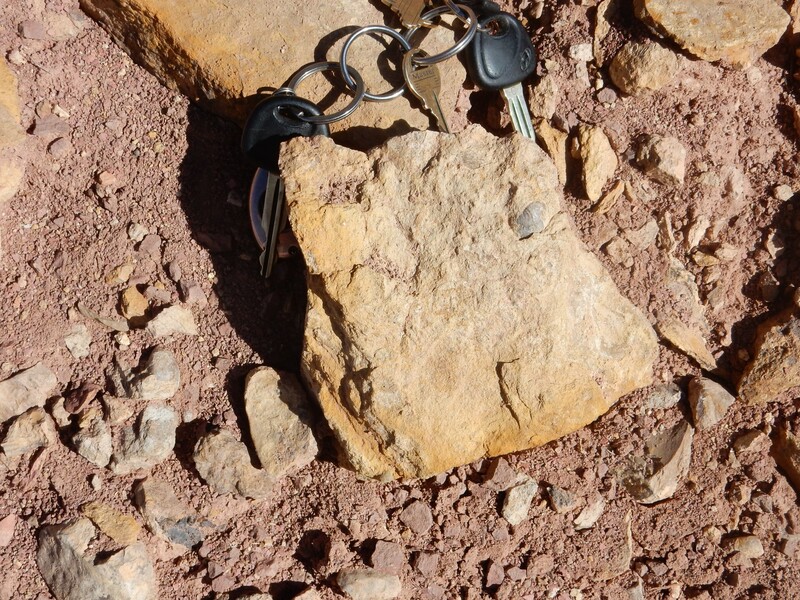 So, maybe fault breccia. But I can’t be sure; this could be a dike of slightly different composition than the dark rock to its east, which pulled in some boulders of the pink gneiss to its west. But this really looks very much like slikensides. And this looks very much like cemented breccia. 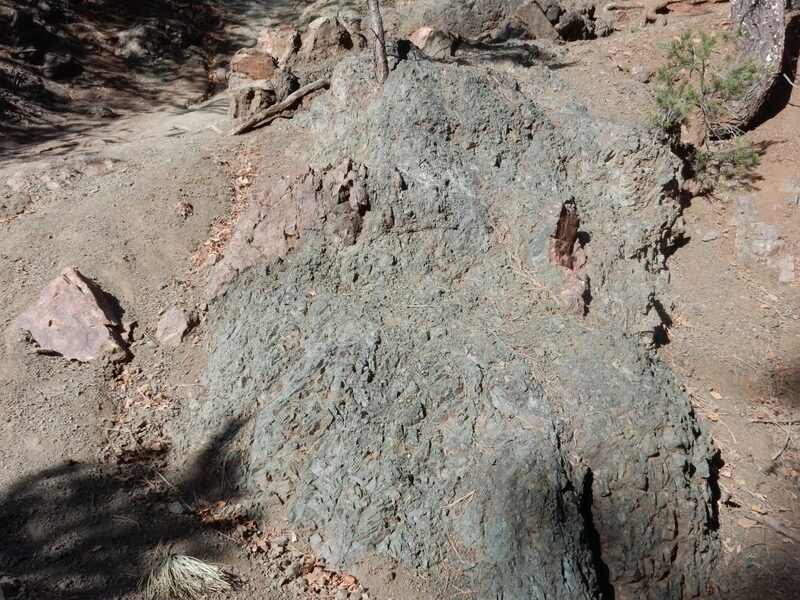 While I’m examining these outcrops, I hear a scuffling above me and look up the trail to see a lady hiker trying to keep her balance on the steep and gravelly trail. Visions of shattered ankles run through my head …. I’m not sure what help I can offer, and she eventually works her way down safely. But I decide this is as far as I go with the SPOT GEN3 service not yet activated and no buddy along, even if it’s a busy trail, supposedly well-maintained, with cell coverage. I turn around and head back. The road log takes me on towards the ski area, with frequent stops for various road cuts. This is awkward; the road log mileages are not that reliable, the road is narrow and busy, and snow is starting to cover the outcrops. But I did stop for this one. I decide to pause here for lunch. 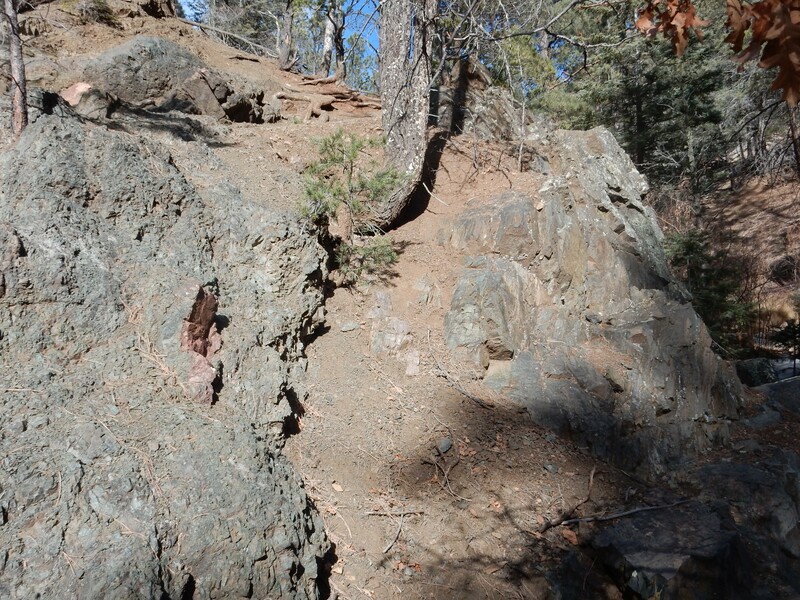 I stop again for an outcrop (with convenient pullout) that is definitely different in character from anything so far. It weathers like amphibolite, but it’s definitely not amphibolite. It looks like a granite gneiss choked with biotite. My road log suggest biotite hornblende tonalite, an intrusive rock composed mostly of quartz and plagioclase feldspar with quite a lot of hornblende and lesser amounts of biotite mica. The stuff is indeed very fragile, because of all the mica. There’s more up the road. The road gets snowier from here, and I decide to turn around. There is a snow-covered forest road to the right, and I pull off … and lose traction. Snow. I try rocking the car back and forth by shifting from forwards to reverse, and notice a big white SUV with Texas plates has pulled over just down the road. Stopping to help? Just then I finally get traction and roar onto the road, and nearly get rear-ended by another car coming down the road as I try to straighten out. Texas Samaritan sees I’m okay, pulls onto the road in front of me … and then goes 15 MPH all the way to Santa Fe. Meh. I’ll cut a lot of slack for someone who has the goodheartedness to stop and be sure I’m okay when my car appears to be stuck. I head up Bishops Lodge Road, where the geologic map promises me outcrops of Bishops Lodge Member (imagine that!) and an associated very old lava flow. I never do spot the flow, even though the map has the road going right through it, and get almost to Tesuque before throwing in the towel. (Should have been here, but I didn’t see it.) But I have no trouble spotting the Bishops Lodge Member. 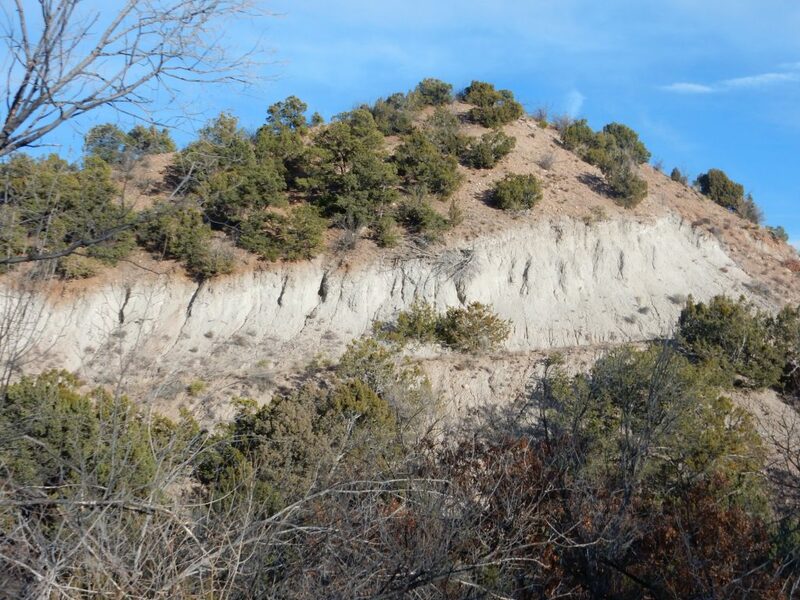 A set of white ash-rich beds originally assigned to the Tesuque Formation, but radiometric dating suggests they’re much older than that, around 30 million years — before there was even much of a rift. 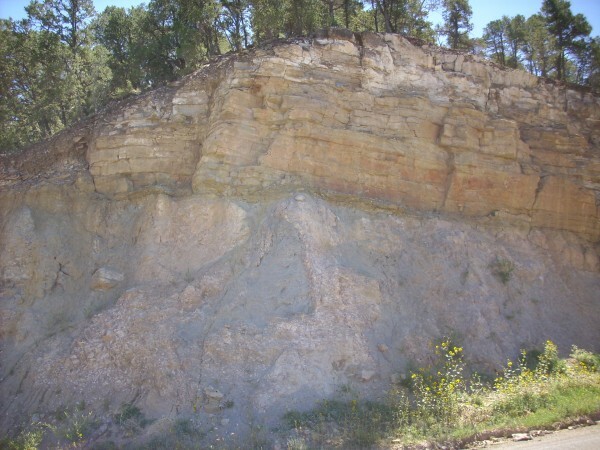 That would be about the same age as the Espinaso Formation flows, away to the west, and so some geologists now count the Bishops Lodge Member as a member of the Espinaso Formation. 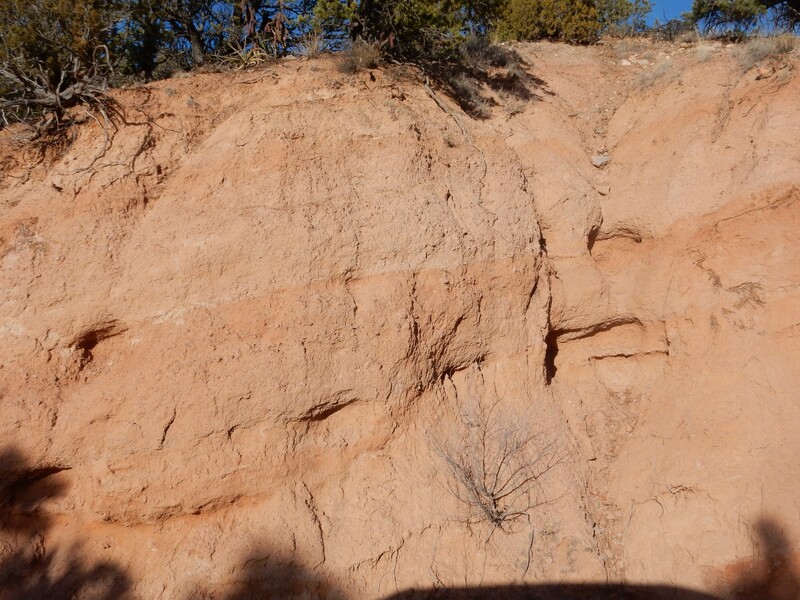 By contrast, here are some more normal Santa Fe Group beds of the Nambe Member of the Tesuque Formation. 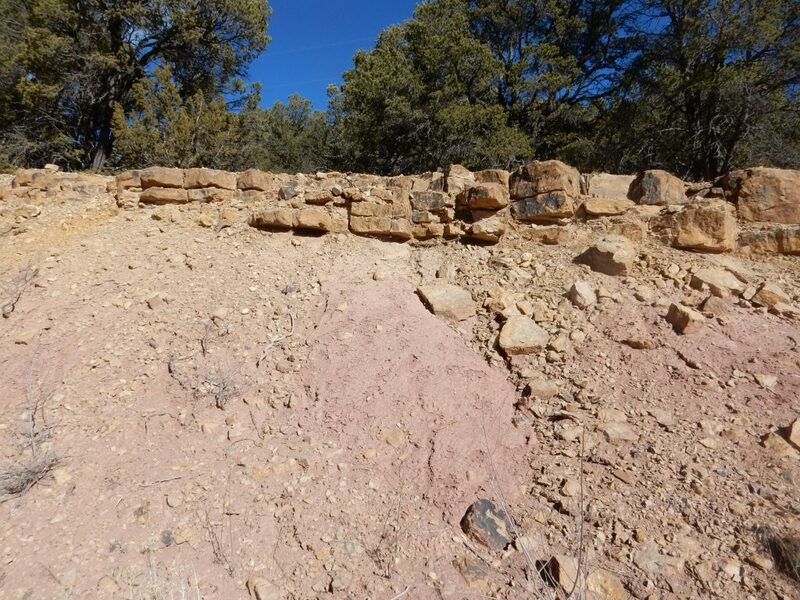 The lovely pink color is from abundant grains of pink feldspar eroded of the Sangre de Cristo Mountains. 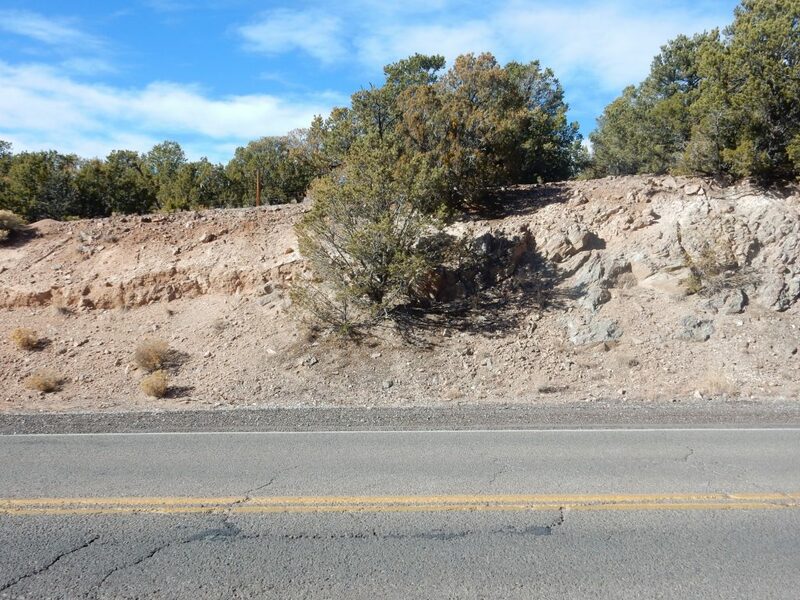 This is so distinctive that beds containing Sangre de Cristo sediments can be traced clear back to White Rock, where they crop out in upper White Rock Canyon and along the main road to Los Alamos. I drove back to Santa Fe, found Lowe’s and the replacement door handle for our front door, stopped at Trader Joe’s for some seed bread and Stilton, and headed on home to finish my chores: Replacing the door handle; changing the water in the fish tank; gathering up the trash from the basement.